In a prospective analysis of ocular fireworks injuries over three consecutive years (1997 to 1999) during the Indian festival of Diwali, 42 patients presented with various types of fireworks-related ocular injuries. Twenty two (52%) patients had to be admitted for the management of their ocular injuries. Fireworks are an important part of the Diwali celebrations. Though fireworks-related eye injuries have been decreasing over the years, there is still a need to increase awareness about the dangers of fireworks. These injuries constitute an important cause of preventable blindness worldwide, and in India, such injuries are very common among children. [1,2] This prospective study was planned to evaluate, the types of fireworks-related ocular injuries and visual outcome in these patients. We evaluated all the patients presenting with injuries from fireworks during three consecutive years during Diwali, from 1997 to 1999. The patients were seen immediately and were either discharged after initial medical treatment or admitted for surgical intervention or observation. Detailed ocular examination, i.e., initial visual acuity, anterior segment examination by slitlamp biomicroscopy, intraocular pressure (IOP) measurement by applanation tonometer, gonioscopy and direct as well as indirect ophthalmoscopy was performed in all patients. USG (A+B) scan was carried out to assess posterior segment status, particularly, retinal detachment, vitreous haemorrhage and to rule out retained intraocular foreign body (IOFB) in patients with hazy media. X-ray of the orbit was done to rule out retained IOFB in all patients. Visual outcome was recorded up to 3 months of follow-up in all the patients. In total 42 patients were seen during three consecutive years from 1997 to 1999, of whom 22 (52.3%) were admitted either for repair of open globe injuries (3 patients) or for medical management (19 patients). There were 35 (83.3%) males and 7 (16.7%) females, the age range of study patients was 3 - 33 years (mean 15.5 years). A majority (26/42; 61.9%) were between 6 and 20 years age. Bombs and cone fountains were the most common types of fireworks causing injury, affecting 35 (83.3%) patients, followed by rockets, 4 (9.52%) patients and sparkles, 3 (7.14%) patients [Table - 1]. Corneal abrasions (closed globe injuries) and multiple foreign bodies involving lids and cornea were the most common presentations. The clinical presentations included corneal abrasions (closed globe injuries) (16, 38.5% patients), multiple corneal foreign bodies (15, 35.7% patients), hyphema (14, 33.3% patients), lid and conjunctival burns (5, 11.9% patients), vitreous haemorrhage (4, 9.5 patients) [Table - 2]. Open globe injury was observed in 3 (7.1%) patients, out of which one (2.3%) had badly ruptured globe. This eye was enucleated. USG (A+B scan) revealed vitreous haemorrhage in 4 (9.5%) patients. None of the patients had retinal detachment or optic nerve injury. Lacerations of lid and iridodialysis was seen in two (4.7%) patients each. One (2.3%) patient also had angle recession. Bilateral ocular injuries were seen in 5 (11.9%) patients. Collateral injuries were observed in 3 (7.1%) patients. There was no correlation found with type of firecracker to the age of patient. However, sparkles produced only conjunctival or corneal burn or corneal abrasions (closed globe injury) without affecting the visual recovery, while rockets, cone fountain bombs and bombs caused lid laceration, open globe injury, iridodialysis, angle recession, vitreous haemorrhage and multiple corneal foreign bodies, all of which led to poor visual outcome. Visual Outcome. Twenty patients who were given first aid and were not admitted had 6/6 vision [Table - 3]. These patients had either lid laceration involving globe or had one or two corneal foreign bodies, which were removed. After 3 months' follow-up, 29 (69%) patients had visual acuity of 6/6 to 6/9; seven (16.6%) patients had 6/18; three (7.1%) patients had 6/60 vision and two (4.9%) patients had 6/36 vision, One (2.3%) patient lost his eye completely due to ruptured globe and this eye was enucleated. The causes of poor vision were corneal scar, astigmatism after corneal repair, vitreous haemorrhage, and macular oedema. The patients who had open globe injury with posterior segment involvement had poor visual outcome while patients with anterior segment injuries involving the conjunctiva and cornea regained vision up to 6/6. 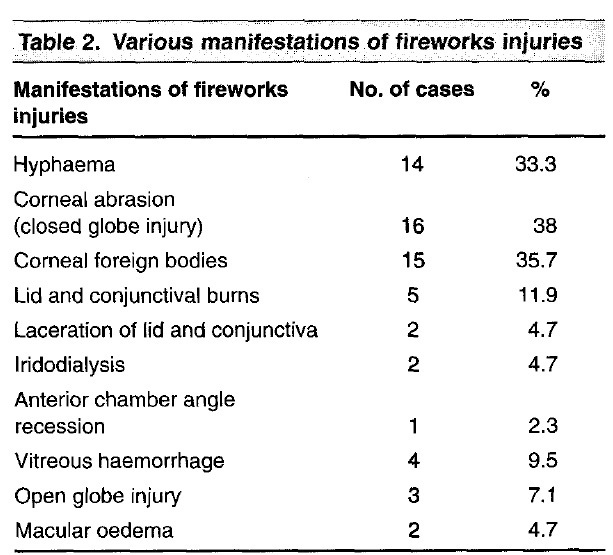 Of all reported ocular injuries, 1.6 - 2% are due to injury by firecrackers. Fireworks injuries occur in most societies. 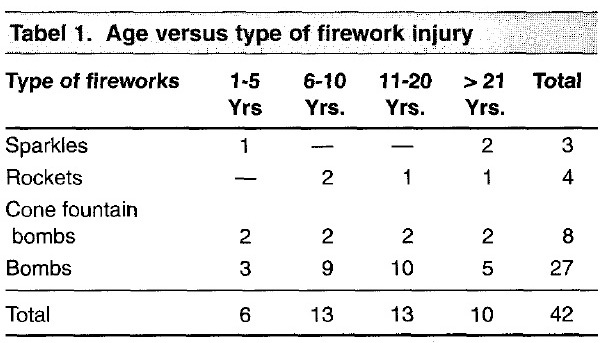 [2,4] Fireworks-related injuries usually affect boys, [1, 2, 4] as observed in our study as well. In India, most fireworks related injuries are reported during Diwali, and Gurupurva. [1,2] Such injuries are common on New Year's Eve in China, the Prophet's birthday in Libya and the Fourth of July in USA. Injuries to onlookers are also very common (14-61%). In our study 3 (7.1%) patients had collateral injuries. We found that bomb and cone fountains were the main cause of injuries. Multiple corneal foreign bodies, corneal abrasions (closed globe injuries) and hyphaema were predominant. Open globe injury occurred in 3 (7.1%) patients. An analysis of accidents involving fireworks shows that most occur because of uncertainty in the timing of explosion. Our experience shows that poor quality of fuse lead is responsible for these accidents. In this study, as in our earlier report, one child was injured in both eyes by igniting collected unspent fireworks in the hearth. Good quality fuse could prevent such accidents. Recently, combination fireworks (Cone fountain with a bomb) have been introduced. These are dangerous. The individual fireworks, though in the safe category, classified as Class C or "Safe and Sane" fireworks (Bottle rockets, sparkles, cone fountains and bombs 1.5 inch or less in size) are dangerous in combination. The uncertainty of timing of explosion is increased, as they use two separate fuse leads. It is suggested that to reduce ocular morbidity further the combination fireworks should be banned and manufacturers should be forced to improve the fuse lead. Those who watch fireworks displays should maintain a safe distance and use protective eyewear. Adults should supervise their wards at such times. Public firework display injuries are extremely rare. Most injuries of children due to manipulated or misused fireworks are totally preventable. Finally, public awareness by print and electronic media can decrease fireworks related ocular injuries significantly. Mohan K, Dhir SP, Munjal VP, Jain IS. Ocular fireworks injuries in children. Afro-Asian J Ophthalmol 1984;2:162-65. Dhir SP, Shishko MN, Krewi A, Mabruka S. Ocular fireworks in children. J Paediat Ophthalmol Strabismus 1991;28:1-2. Kuhn F, Morris R, Witherspoon D, Heimann K, Jeffers JB, Treister G.A standardized classification of ocular trauma. Ophthalmology 1996;103:240-43. Wilson RS. Ocular fireworks Injuries. Am J Ophthalmol 1975;79:449-51. Newell FW. Fireworks blindness. Am J Ophthalmol 1972;74:167-68. Sundenlin K, Norrsell K. Eye injuries from fireworks in Western Sweden. Acta Ophthalmologica Scandinavica 2000;78:61-64. Mohammadi, S.F., Mohammadi, S.M., Ashrafi, E., Hatef, E., Rahbari, H.
Rashid, R.A., Heidary, F., Hussein, A., Hitam, W.H.W., Rashid, R.A., Ghani, Z.A., Omar, N.A.C., (...), Shatriah, I. 3 Can fireworks-related injuries to children during festivities be prevented? Smittenberg, M.N., Lungelow, D., Rode, H., van As, A.B., Millar, A.J.W. Marsal, C., Abry, F., Bouyon, M., Meyer, N., Bourcier, T., Speeg-Schatz, C.
Saadat, S., Naseripour, M., Smith, G.A. Kumar, R., Puttanna, M., Sriprakash, K.S., Rathod, B.L.S., Prabhakaran, V.C. Ocampo, H.H., Contreras, J.C., Martínez, A., Amaya, C.A., Bonilla-Escobar, F.J.
Shah, M., Shah, S., Khandekar, R.
Mehta, S., Agarwal, V., Jiandani, P.
Pushker, N., Bajaj, M.S., Sharma, V., Balasubramanya, R.